**DON'T MISS OUT ARRANGE YOUR VIEWING TODAY** Gates are delighted to present to the market this four bedroom three storey townhouse. With accommodation briefly comprising; entrance hallway, wc, dining kitchen with snug area, lounge, master bedroom with en suite shower room, three further bedrooms and family bathroom. The property enjoys gas central heating, double glazing, integral garage and gardens. Located in the popular area of Monk Bretton which has good transport links and good local amenities. A front facing glazed composite door opens into the hallway which has access to the wc, oak effect lino flooring, modern decor and stairs rising to the first floor landing. The hallway also houses the alarm system. Housing a two piece suite comprising; low flush wc and wash basin. There is some mosaic tiling to the walls, tiled flooring, radiator and extractor fan. Open Plan Dining Kitchen with snug. This open plan area is ideal for family living and entertaining. Having a range of wall and base units with work surfaces which incorporates a one and half bowl stainless steel sink and drainer. 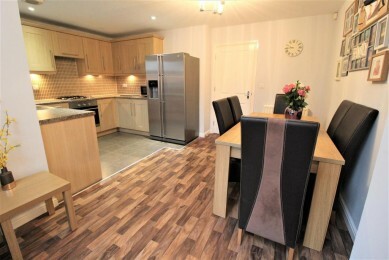 Integrated appliances include; dishwasher, automatic washing machine, electric oven and gas hob. There is under unit lighting, a rear facing double glazed window space for a double fridge freezer and this room houses the boiler. With Oak effect lino flooring, radiator, side facing double glazed window and double glazed patio doors which lead out to the garden. Stairs from the hallway lead up to the first floor landing which has access to the lounge and master bedroom. A second staircase leads up to the second floor. This well presented room has modern decor with feature wall, neutral carpet, rear facing double glazed window and patio doors with Juliette balcony. This master bedroom has a front facing double glazed window, neutral carpet and fitted wardrobes to one wall. Access is given to the en suite shower room. With a modern suite comprising, low flush wc, pedestal wash basin and step in shower. There is a radiator, double glazed opaque window, tiled flooring and half tiled walls. Stairs from the first floor landing lead up to the second floor landing which has a store cupboard which houses the water cylinder. Access is given to three bedrooms and the family bathroom. A front facing bedroom which has a radiator, neutral decor and carpets and two front facing double glazed windows. A rear facing bedroom which has a radiator, neutral decor with feature wall, carpets and a rear facing double glazed window which provides views. This single bedroom has a radiator, a rear facing double glazed window and neutral decor and carpets. Having a three piece suite comprising; bath with mixer shower above, pedestal wash basin and low flush wc. There is a radiator, extractor fan, tiled floor and half tiled walls. A tarmac drive to the front of the property leads to an integral garage which has an up and over door, power and lighting. To the front of the property there is a small lawned area, whilst to the rear there is an enclosed garden with patio seating area and lawn. There is also an access gate. If you have a property to sell our valuer will be pleased to arrange an appointment to give you a market valuation and advice. The advisory service is free and without obligation.